Jennifer of Never Just Jennifer. Jennifer is one of the members of the Round Trip Quilts group and I can't wait to start working on her quilt. She has started a series on her blog called Mosaic Tuesday, in which she shares colour inspiration, which is especially helpful to people like me who always doubt their colour choices. Fiona of Celtic Thistle Stitches. Fiona's blog is so much fun. She's not afraid to try new techniques and she shares the beautiful results. Plus, she travels all over the place and shares amazing pictures of far-flung sights and quilty inspiration. She also hosts the 'New to Me in 2014' and 'Ho Ho Ho and On We Sew' linky parties. Erin of Sew at Home Mummy. I'm not sure how she does it, but Erin's posts are often funny even when they're about regular, not funny stuff. Her post trying to persuade readers to buy a new iron was fantastic (though I didn't buy the iron!). 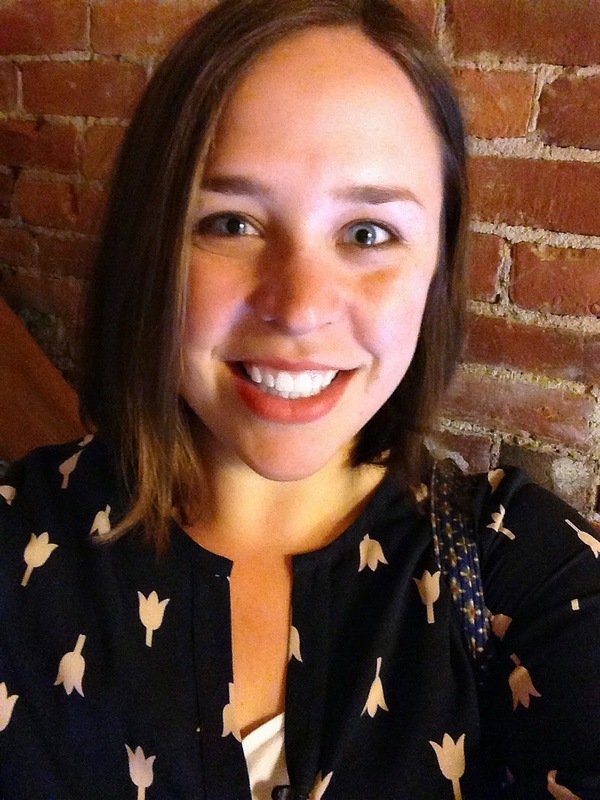 In the spring she did a great series called Beautify Your Blog where she shared lots and lots of tips for fixing/changing/adding things on your blog. And she's a fellow Canadian, though from the other side of the country and currently living in Chicago. These three beautiful ladies will share their answers to the questions next week and tag another round of bloggers so we can all go meet more new friends. Sounds fun, doesn't it? Let's see...1,2,3... Maybe we shouldn't count them all! I love having a bunch of projects on the go all at once. I may not finish any one particular project as quickly as if I worked on things one at a time, but I enjoy being able to pick what I want to work on each day. Here are two of the current projects. After finishing my hexie quilt top, I needed a new hand stitching project. Though I'll probably hand quilt my hexies, it's still too warm to even think about sitting under a quilt for hours, so I wanted something smaller. 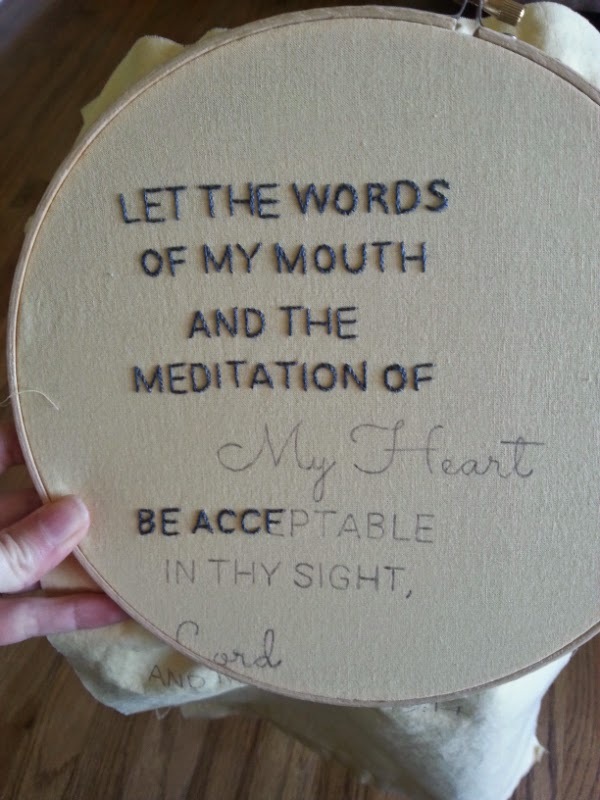 This little embroidery project is just right. Plus, I love the verse from Psalm 19. A couple of nights ago, I finished making the last of the blocks for my A Walk in the Park quilt using the beautiful batiks Paul bought for me. Now I can figure out how to distribute the colours evenly and get the top put together. I'd love to have this one ready when the cool weather sets in. You know, for those evenings when I'm not sitting under the hexies, quilting! I think this is the toughest question of them all. My honest answer is, I'm not really sure. 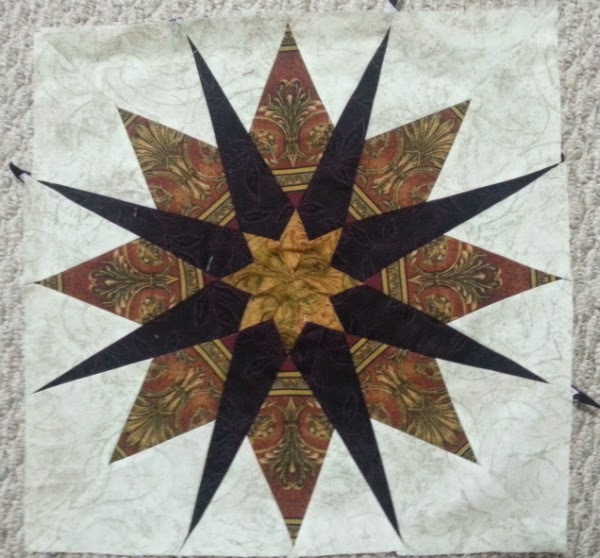 I know I like really intricate piecing, like in this Jinny Beyer design I still haven't finished. 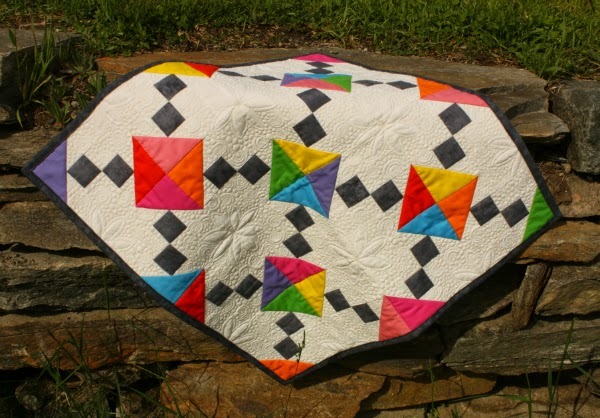 But I like the minimal piecing look of modern quilts too, like in my version of Canvas, designed by Leanne of She Can Quilt. I also know I'm not a big fan of most of the current favourite fabric designers, mostly because I don't really like large scale prints. I prefer small scale prints and those that don't have a lot of different colours in them. 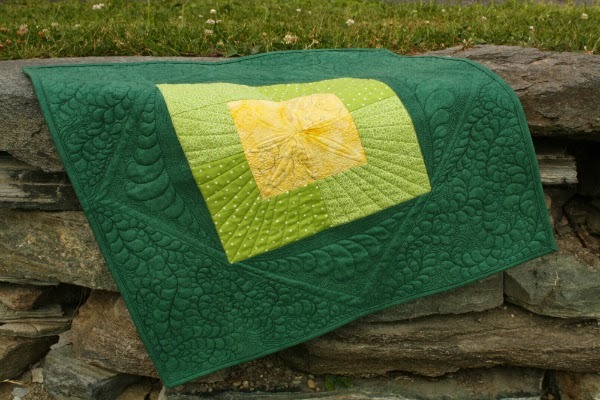 I've only sewn one quilt with solids so far, but I certainly want to play with them more. This one is easy...because I love it! I love playing with fabric and creating pretty things to look at or use. I love giving gifts I've made. I love looking at patterns or blogs and dreaming of all the things I'd make if only I had a hundred hours in each day just for quilting. My favourite way to describe how I feel about quilting (and blogging) is "I am having so much fun!" As for the writing, I've always wanted to be a writer. I love writing about living for God and I love having the self-imposed deadline of posting a new devotion every Monday morning. To see a list of the devotions I've written so far, go here. For quilting, I don't think I have a process I follow all the time. Sometimes I see a pattern I need to make, even if I don't yet have a use for it, other times I want to make a gift for someone and I go looking for just the right thing to make. Sometimes I jump on board with something I see online, like a chance to test a pattern, or to be part of a quilt swap. More rarely, I have fabric on hand and search for a pattern to make perfect use of it. Usually it's the other way around, though, since my stash actually isn't all that big and it's mostly composed of scrap sized pieces now. 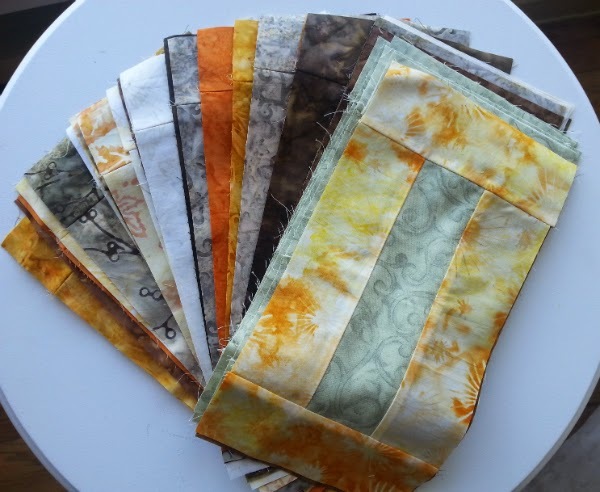 I like to switch from project to project, and I love when my projects are at different stages so I can decide if I want to be pulling fabric, piecing or quilting on a given day. When I'm close to finishing a top, or a whole quilt, I usually work on that project the most because it's so exciting to have a finish. I don't know that I have a particular process for writing either, other than procrastination. Boy, am I good at that! Usually, I think about the devotion for a few days, writing out sentences in my mind long before I ever sit with the computer. Writing directly onto the computer first is actually a new process for me. For years I had to write everything out on looseleaf, often doing several drafts before being ready to type it in. I'm not using nearly as much paper now that I'm typing right from the start! Well, Jennifer, Fiona and Erin, over to you. You're IT! It's good to see you've picked up a new hand sewing project, but I am totally looking forward to seeing you finish the hexie quilt! :) I would also say that you are bold, adventurous, and creative in your quilting - just look at the canvas quilt and swap quilt in this post alone. So awesome! I've been following you on Bloglovin' for a while, but it was nice to get to know you more. Great post, Leanne. I'll be Around the World blog posting on 9/1. Love your work, especially that hexie top. Thank you so much for tagging me - I'm excited! Love the embroidery! I'm like you with lots of different projects in various stages on the go. Sometimes the finishes all come together but most of the time its a continuous WIP! your quilts are awesome, love them.